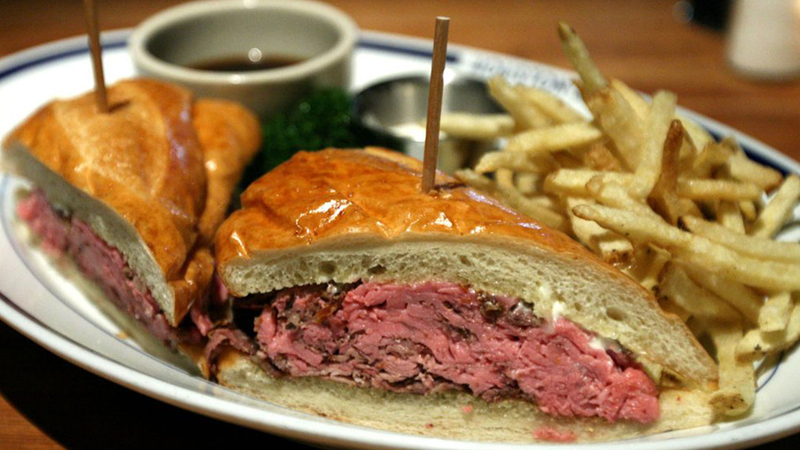 The French dip sandwich, an L.A. culinary invention, turns 100 years old this year. Or 110. It was invented by accident, from a dropped sandwich loaf. Or it was invented for a customer with bad teeth. Or it was invented to cover up the use of day-old baguettes. One of Los Angeles’ contributions to the wider food world still doesn’t have a settled-upon origin story. Two different restaurants—Philippe the Original (often referred to as Philippe’s, for short) and Cole’s, each a short Metro ride away from the Hollywood Roosevelt—claim the French dip as theirs, complete with creation myths (multiple at Philippe’s, in particular). And while many have thrown their weight behind one or the other institution, we may never know the actual creator. Over the years, different sources have told competing stories about the French dip’s roots at Philippe’s. The restaurant’s site claims it was accidental: Philippe Mathieu dropped a French roll into a roasting pan, and the customer said he didn’t mind. He returned the next day, lore says, and the sandwich was born. But Mathieu’s grandson, also named Philippe, told Charles Perry of the Los Angeles Times something a little different in 2008, on the occasion of the restaurant’s 100th anniversary. Leftover rolls were to blame, with a customer complaining that the bread was too dry, and the elder Mathieu dipping them in pan drippings to get the patron to move on. The restaurant’s site claims it was accidental: Philippe Mathieu dropped a French roll into a roasting pan, and the customer said he didn’t mind. He returned the next day, lore says, and the sandwich was born. There is also word from the originator himself. 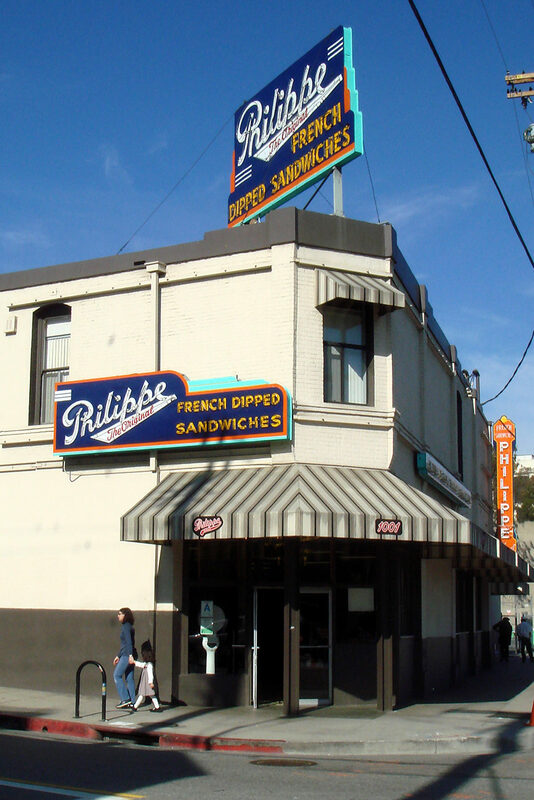 According to research done by Thrillist’s Jackson Landers, the original owner of Philippe’s said in a 1951 LA Times interview that the sandwich was created in two phases. A police officer asked for a split French roll turned into a pork sandwich, then a later customer asked that the roll be dipped in the gravy remnants of a dish used for roasting meat (meaning that the French dip, as we call it, should be pork and not beef). The story at Cole’s has been more consistent over time: A chef here supposedly started dipping bread in the beef juices in order to help a customer with bad teeth. However, it’s hard to turn up any evidence that the sandwich existed before Philippe’s (Cole’s claims it was created in 1908, making it 110 years old), and no interviews with the original owner, Henry Cole, seem to exist, according to Landers. Either way, the two restaurants have diverged in terms of experience over the past decade. Philippe’s charges 45 cents for coffee, while Cole’s charges $10 for Old Fashioneds (still a decent deal for this part of town). The former, Perry says, “is such an institution in a city of endless change.” The latter, which operated for 99 consecutive years at one point, closed in 2007 and was saved by downtown nightlife impresario Cedd Moses. It now features a page-long cocktail menu and a speakeasy, The Varnish, that won “Best American Cocktail Bar” at the Tales of the Cocktail Spirited Awards in 2012. But no matter how their presentations drift apart, Philippe the Original and Cole’s will likely be tied together by this odd L.A. mystery for as long as the doors of both remain open.